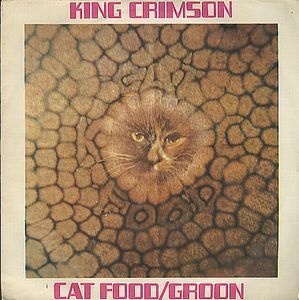 "Don't think I am that rude if I tell you that it's cat food, not even fit for a horse"
Cat Food is an early single by King Crimson released in 1970. The title track is an edited version of a song from the band's second full-length album In The Wake Of Poseidon from that same year. The song is not a particular favourite of mine but one has to admit that it is probably one of the most suitable songs from In The Wake Of Poseidon to be released as a single. I prefer the longer album version anyway as this edit sounds truncated. What is of special interest here is the b-side Groon. Or at least it is interesting in virtue of being a non-album b-side. However it is actually not very interesting in its own right as it is a jazzy, improvised piece that comes across as a throw- away. I don't particularly enjoy listening to it at all to be honest. Both the edited version of Cat Food and Groon have now been made available as bonus tracks on the remastered CD version of In The Wake Of Poseidon so there is really very little intrinsic value in this single. For completionists only.